If you are a fantasy lover and haven't read Brandon Sanderson yet, you really really need to. If you also don't have enough time or energy to read his 1,000+ epic fantasy books, then this novella is great choice for a starting off point. 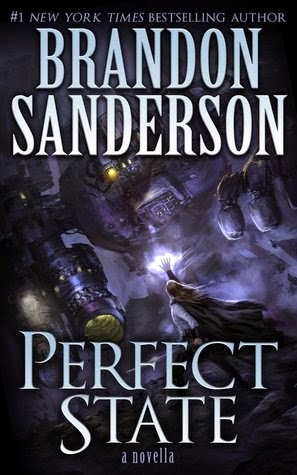 This is the third novella Sanderson has published this year and I'm so grateful that he is the kind of author who publishes shorter works between coming out with those large epic fantasy books I mentioned, mostly because when I need a fantasy fix for my reading life Sanderson delivers. I found Kai to be a character that I both loved and was annoyed with, but the annoyance developed into more of a connection with him and his motivations - which is quite impressive for the length of the work. That is simply a given with Sanderson though, I've noticed his character development is hardly ever lacking and he has the ability to make me feel connected to characters who are completely opposite of myself. The story was simple, with a lot of potential for growth and development within the world Sanderson has created and I hope he comes out with more about Kai's, even though it was a good stand alone novella. It was also thought provoking and somewhat philosophical, which is a huge plus for me. I love it when stories have layers and stick with me as I think about what I would do in a similar situation, or try to figure out why some character acted the way that they did. I will also put in, trying not to give anything away, that this story was both fantastical and science-fictional, which is a direction Sanderson seldom goes. I found the new terrain to be covered well and enjoyed what he did with a science-fictional kind of world mixed in with the fantasy world. I enjoy these two genres of writing and Sanderson created an impressive, at times humorous, hybrid. Again, I was pleasantly surprised by how well Sanderson pulled all of these things off within the length of this work. Give it a try, you won't be sorry. At first I rated this book 4/5 stars, because I wasn't left in awe as much as I usually am by my 5/5 star books, but when I thought about it again I realized that I am totally planning on reading this book again someday, probably more than one more time. It's a quick easy read that is fun and even if he doesn't come out with more stories about Kai and his world, I found this story compelling enough to reread and think more about. I chose non-alcoholic wine because 1- I believe wine is the only drink mentioned in the book... besides water and couldn't find anything better to go with it; 2- although I used to drink wine with alcohol in it myself I don't anymore and wanted to recommend a non-alcoholic version (there is some alcohol content, but it's just for flavor and is less that 0.5% by volume) for anyone interested in trying it who also doesn't drink either; 3- I like to recommend trying new things, like Brandson Sanderson and novellas as well. So, give it a try if you want to, I think ARIEL's Cabernet Sauvignon would pair well with the action and giant robot in this piece.